Have you heard of the Hail Varsity cover anti-jinx? We put out our first full-on volleyball issue last August and, well, you saw how the 2017 season played out. The Volume 7 Issue 6 cover of Hail Varsity. Totally kidding, of course. Nebraska volleyball doesn't need any magical, mystical help from us. It does just fine with its own blend of unparalleled fan support, top-flight coaching, extraordinary effort and everything else. Nevertheless, The Volleyball Issue (a quite plain title that I quite like) is a fixture now –– not to mention sold out a year ago –– and the new one is headed your way this week. 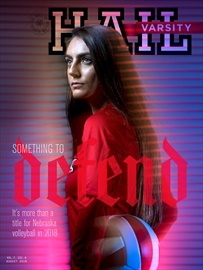 Senior libero and captain Kenzie Maloney is on the cover along with a word you're going to be hearing a lot from the Huskers this season. It's part of one of their team mantras for the year –– a saying Maloney explains in detail in staff writer Jacob Padilla's cover story on the season ahead –– and let's just say it feels like a perfect fit. The cover was shot by staff photographer Eric Francis, who also shot the stunning volleyball portraits you'll find inside. In addition to a season preview, Lauren West, our resident volleyball expert and the only member of our staff to have achieved All-America status in the sport itself, breaks down what looks like a wide-open year in the Big Ten. You'll find some additional volleyball goodies in many of our standing features as well. A photo essay highlighting Nebraska football's first week of fall camp. Recruiting analyst Greg Smith looks back at a very productive summer for the Huskers on the recruiting trail. Editor Mike Babcock writes his column on the importance of Tom Osborne's involvement in Nebraska football moving forward. A Q&A with sophomore quarterback Andrew Bunch, in which he reveals who the best gamer is on the Huskers' roster. The August issue of Hail Varsity ships this week. Make sure you don't miss an issue by subscribing today.